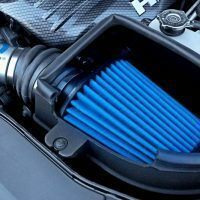 Why are aftermarket air intake systems so popular? 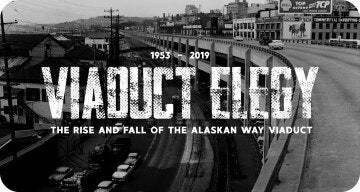 A related question might be why replace the factory system which was designed by the engineers who built your vehicle? Today, we’ll describe the advantages of performance air intakes, and also talk about their ease of installation. 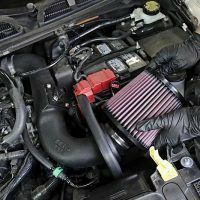 First, let’s cover some basics about your car’s engine. An internal combustion engine (gas or diesel) operates like an air pump. Air, mixed with fuel, is brought into the cylinders, compressed, burned, and expelled as exhaust. All things being equal, the engine’s ability to “breathe,” or bring in more air, has a positive effect on its ability to produce power. A vehicle’s factory air intake system is a compromise. 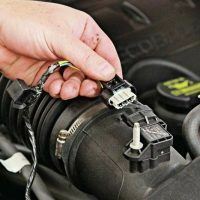 The automaker’s job is to balance air flow, noise, underhood packaging, and service access, while still meeting power and fuel economy targets. A majority of car owners accept this. 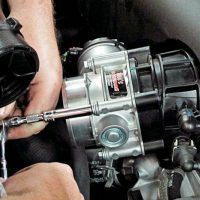 But once you’re educated to the advantages of replacing the factory system, you’ll see how easy and affordable it is to squeeze more power from your ride, with minimal (if any) impact to fuel mileage. Original Equipment (OE) pieces must fit within a confined engine compartment. 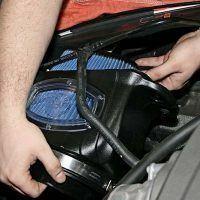 The air filter, small and flat, limits air flow because of its size and shape. Its location is chosen for its accessibility. 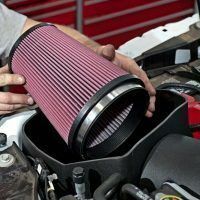 Aftermarket systems relocate the filter, allowing it to be larger. The air intake tubes can now be larger in diameter, with fewer bends. All of these changes dramatically increase air flow. 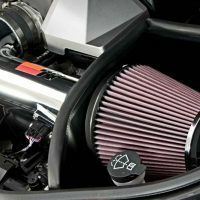 The filter may be less accessible, and the intake sound may be less muffled, but these are considered worthy trade-offs. The increased air flow, thanks to modern fuel injection, is matched with an increase in fuel, maintaining the correct fuel/air ratio. The net result is more power. But there’s more good news, having to do with air temperature. Cooler air is more dense, meaning it packs more oxygen molecules in a given space. If we bring cooler air to the engine, we gain even more power. Engineers estimate that every 10 degree drop in air temperature increases power by 1 percent. Almost all performance air intake systems relocate the filter so that cooler ambient air is available. 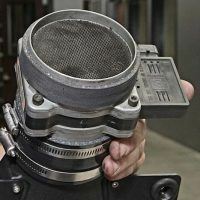 In some cases, the filter is on the side, instead of on top of the engine, with a shield to block engine heat. In the best scenarios, the filter is moved completely out of the compartment so that it can pick up outside air. 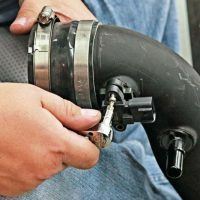 This cooler, denser air improves the engine’s efficiency and, when driven with a light throttle, some vehicle owners report better gas mileage. 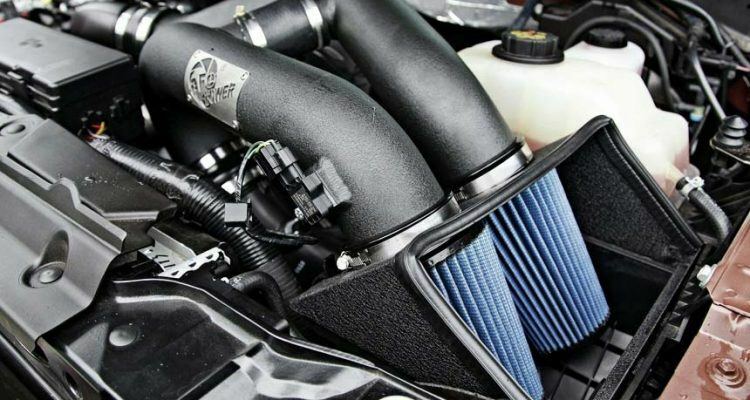 Performance air intake systems are quite affordable. 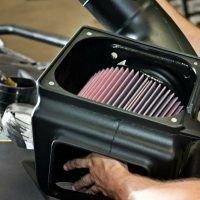 Be sure to look at your options: filter location, tube material, and inclusion of an air box all affect price. For most vehicles, you have a choice of systems from different manufacturers. Installation can be done by most owners in their driveway, with common hand tools. First, the factory intake plumbing must be removed. Most of it is plastic, held down with nuts and bolts. The air filter, filter box, and tubing are unbolted and discarded. With the new system, study the air tube’s routing before you put anything in place. Some tubes are powder-coated aluminum (adding a nice visual element to the underhood display), so take care not to scratch it. The trickiest part of the install may be locating the new filter, especially if it’s under the front bumper. You may need to raise the car’s front or remove underbody panels for best access. Install everything: the filter, tubing, and brackets, but leave all the hardware finger-tight. Make final adjustments to the components, then tighten it all down. Also, make sure to reinstall any sensors into the tube’s grommet, if that is applicable to your engine. 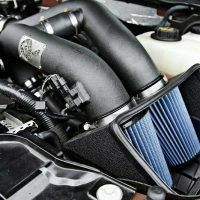 Though modern vehicles with their computer-controlled engines are difficult to improve upon, now you know the simplicity and cost effectiveness of performance air intake systems. Get yours and enjoy that little extra oomph every time you put your foot into it! *Richard Reina is a Product Trainer at CARiD.com and lifelong automotive enthusiast. No Comments on "Performance Air Intake Systems: A Cost Effective Way to Boost Power"